Having frogs in the garden is definitely a worthy goal: frogs will help keep down insect populations as well as serenade you with their songs. However, the best way to share your garden with frogs is to simply build a frog-friendly pond. Re-creating their natural habitat is the best way to attract frogs (toads are good too) and keep them from wandering off in search of more frog-friendly surroundings. Keep in mind that if you live in an area or climate where frogs are not often seen, the chances of attracting frogs is obviously slim. However, in these areas, bringing in frogs is not likely to work either, because frogs do not naturally thrive in those conditions. By building a frog-friendly pond, you will be limited to native species, and this is for the best. Non-native species pose a problem two ways: they will either not survive, or they may survive and establish a local population, which could be disastrous for the local ecosystem. Either way, they can spread diseases, such as the devastating Chytrid fungus. It is also relatively effortless to meet the needs of a native species, especially when it comes to dealing with local weather conditions. Easy Access to the Water. A pond with sloped sides is necessary to allow the frogs to easily get in and out of the pond. Using a flexible pond liner to build a frog pond that gradually slopes from shallow to deep is best. A pre-formed plastic liner can be used but you must place rocks or other items in the water in such a was as to make a ramp for the frogs to get in and out. The pond does not have to be overly large, though. Skip the Aeration, Filtration, and Water Falls. Frogs like quiet, still water. No Fish. Fish are natural predators of frogs, especially eggs and tadpoles. Add Plants In and Around the Pond. A variety of water plants such as water lilies help to provide cover, shade, and a more natural environment. Likewise, provide plants around the pond for shelter and shade (hostas, ferns, wildflowers, etc). In addition, let the grass grow longer around the pond for extra cover. The plants in and around the pond will attract insects and other organisms that frogs feed on. Native plants are best -- check with your garden center for advice. Don't Keep It Too Clean. Remember most natural ponds are not sparkling clean. Organic matter in the water helps create natural conditions and feeds the natural prey for the frogs. Algae in the pond also nourishes tadpoles. Provide Extra Shelter. Place a couple of clay plant pots, on their side and partly buried, to provide extra shelter and shade. Remember frogs like it damp and cool, and also need places to hide from predators. Minimize Predators. If you have dogs and cats, try to limit their access to the pond area. You may want to put a wire fence around the pond area to help keep predators away. Keep it Chemical Free. Frogs are very sensitive to pollutants and you do not want to use garden chemicals in your yard that might ultimately hurt the frogs. Once you have built the perfect pond, it may take a while for it to become well-established and for local frogs to find it. 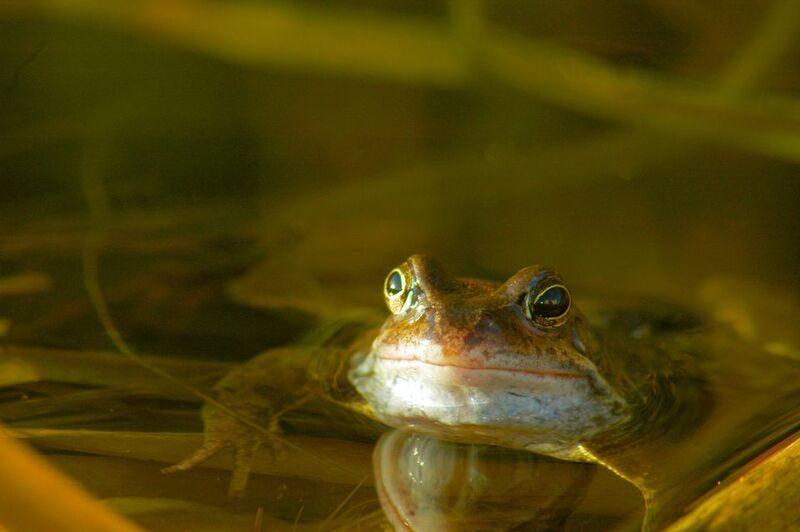 Resist the temptation to catch frogs to put in your pond, as adult frogs have established a home and may try to return to it. If it is legal, you may try catching tadpoles to put in your pond, but check you local wildlife laws as collecting tadpoles is illegal in many places.